Despite the fact that nearly 62 percent of Americans have a pet, there are still more than 70 million homeless dogs and cats living in the U.S. Of these 70 million needy animals, only around six to eight million enter shelters each year. Although they only take in a fraction of America’s homeless animals, these shelters are mostly packed to capacity and strapped trying to function with limited funds. Yet, regardless of this wealth of pets looking for loving homes, only around 20 percent of Americans adopt their dogs from shelters. So where are the other 74 percent coming from? Well, breeders. You can find virtually any breed of animal in your local shelter – purebred or mixed – but consumers continue to pay hundreds, sometimes thousands, of dollars for dogs from breeders. Some believe that by purchasing their dogs from a special breeder they will somehow be getting a “superior” pet, however, not only is this false but there are a number of other reasons that breeding dogs is irresponsible and harmful no matter how good their reputation may be. Consumers looking for a new family pet are willing to pay exorbitant amounts for a purebred dog because they’re told that the puppy has been raised in a loving environment and will grow up to have a friendly disposition with minimal health problems. However, there is no way to really tell because in many cases, it’s dependent on the individual dog. While there may be breeders that take precaution to avoid inbreeding (which often leads to significant health issues), and are selective with the dogs they do breed, making sure to raise them in loving environments, there is no definitive “rule” that guarantees these animals won’t suffer from health or behavioral problems early or later on. You can never forget that breeders are still trying to run a business at the end of the day, so it is only in their best interest to advertise the benefits to owning a purebred, and even perpetuating the myth that certain positive attributes cannot be found in shelter dogs. Ironically, the Humane Society estimates that 25 percent of dogs in shelters are purebred. Now, when we refer to “reputable” breeders, it’s merely to differentiate between those that breed their animals “responsibly,” and those that don’t. A lot of consumers don’t do research prior to purchasing their new four-legged family member, and as a result, end up buying their new best friend from cruel puppy mills. Others rely on the American Kennel Club’s (AKC) inspection certification to ensure that the dogs they purchase are both purebred and don’t come from an abusive background. However, an exposé into the AKC’s inspection program revealed that many of these certified breeders subject their dogs to puppy mill-like conditions as well. Although the AKC is considered the highest authority on purebred dog standards, Ed Sayer’s, the President of the ASPCA, stated in the New York Times that a number of the raids his organization has carried out involved commercial breeding facilities that were registered with the AKC. Many puppies who come from puppy mills suffer from serious health problems as a result of reckless breeding. For example, the New York Times highlighted the story of one woman who purchased a puppy from an AKC breeder only to find out the puppy suffered from a number of abnormalities as a result of reckless breeding practices; the breeder had passed AKC’s inspection only two weeks prior. Two months later the facility was raided and all of the dogs were removed from the breeding facility. When a representative from the AKC was questioned as to just how many breeders have AKC registered dogs in the country, they admitted that they did not have those figures. While the AKC may not believe they’re responsible for all breeders, their approval of these substandard facilities is deceiving to consumers and frankly, they should be held accountable for the breeders they certify. Reputable breeders have a passion for breeding dogs and many do genuinely love the animals they care for, but that does not address the very real problem of what breeding pets does to the existing pet overpopulation problem. According to the ASPCA, 1.2 million dogs are euthanized in shelters every year because of lack of space, resources, and people who are willing to adopt these animals. No matter how you look at the issue, the idea of producing more dogs to meet the “demands” of people who are willing to pay thousands of dollars for a purebred pup while there are hundreds of thousands of purebred dogs waiting in overcrowded shelters is incredibly irresponsible. The fact is, all dogs deserve a loving home, but when these dogs become commodities who are bred for profit, it doesn’t matter how well-meaning or qualified the breeders are. If we wish to put an end to the gross pet overpopulation problem and provide loving forever homes for dogs who truly need it, there is no real justification for the perpetuation of dog breeding. So please, be a Green Monster and always adopt, don’t shop! Evanger’s Dog & Cat Food has recently issues a recall on some of their products after traces of pentobarbital were found in their food. Pentobarbital is a sedative normally used to euthanize horses, cats, and dogs. Evanger’s Hunk of Beef Dog Food is currently the only product suspected of contamination. The manufacturer is subsequently voluntarily recalling all Hunk of Beef items bearing lot numbers that start with 1816E03HB, 1816E04HB, 1816E06HB, 1816E07HB, and 1816E13HB, and have an expiration date of June 2020. The FDA reports that the second half of the bar-code should read, “20109,” and it can be located on the back of the product label. These five lots of food are the sole focus of the recall, as they were all produced with the same lot of beef from the same supplier that is specifically used for the Hunk of Beef product. So far, five dogs have reportedly been affected by consuming this tainted product, and one sadly passed away. The deceased pup had consumed food bearing the lot number 1816E06HB13. Fortunately, Talula’s three “siblings,” Tito, Tank, and Tinkerbell, survived after an emergency trip to the vet. Talula’s post-mortem examination revealed that pentobarbital was the cause of death. Evanger’s has reportedly paid for all of the dogs’ medical bills and donated to an animal shelter in Talula’s honor. The dog food company has also paid for the medical bills of two other dogs. The company, which claims to only use USDA-approved beef for their food, also commented that they had thought “something like this seemed impossible.” Evanger’s has also “terminated” a 40-year relationship with their beef supplier — which also supplies to other pet food companies. Oddly enough, the FDA has already examined the potential side effects pentobarbital may have on pets: the federal agency has even conducted a study on how much of the sedative needs to be present in a dog’s kibble to do harm. The research, done some 15 years ago now, concluded that the most pentobarbital a dog would likely consume was 4 micrograms per kilogram of bodyweight per day — an amount they concluded was “harmless.” Of course, these findings only pertained to dry kibble; Hunk of Beef is a canned food. While the researchers found pentobarbital poisoning to be unlikely, it has become a reality: the amount of phenobarbital in dog food — at least canned dog food — does have the potential to be harmful. And it certainly makes you wonder: is pentobarbital in human food, too? Recently a 3-year-old Pug named Bruce in Overland Park, Kansas discovered a tin of sugar-free Mentos and helped himself. Within a half-hour, Bruce was lethargic. Fortunately, his owner connected the dots between the Mentos and Bruce’s rapidly deteriorating condition. After calling the veterinarian’s office, as he picked Bruce up to rush him out to the car, the dog went limp. Once at the vet’s office, he had a seizure. The mints Bruce had eaten contained xylitol, a sweetener that is highly toxic to dogs. It’s a sugar alcohol extracted from corn and corn fiber, birch, raspberries and plums. Xylitol is used to sweeten a wide range of products, including sugar-free gum and mints, nicotine gum, chewable vitamins, certain prescription drugs, dental hygiene products and baked goods. Xylitol can also be purchased in granulated form as a sugar replacement to sweeten beverages, cereals and other foods. Fortunately for Bruce, the veterinary staff quickly treated him with glucose water and monitored him closely. He survived the initial crisis, but they don’t know yet if there has been permanent damage to his liver. Xylitol poisoning in dogs is reaching epidemic proportions according to some sources. The sweetener is being used in an ever growing list of products because it’s as sweet as sucrose, but with only two-thirds the calories of sugar. It’s less expensive than other sugar substitutes, tastes better and causes little if any insulin release in humans. Just a few years ago, xylitol could be found in less than a hundred products in the U.S., primarily limited to sugar-free gums, candy and foods. Today it can be found in a wide range of health and beauty products, food products, over-the-counter drugs and supplements and prescription medications. 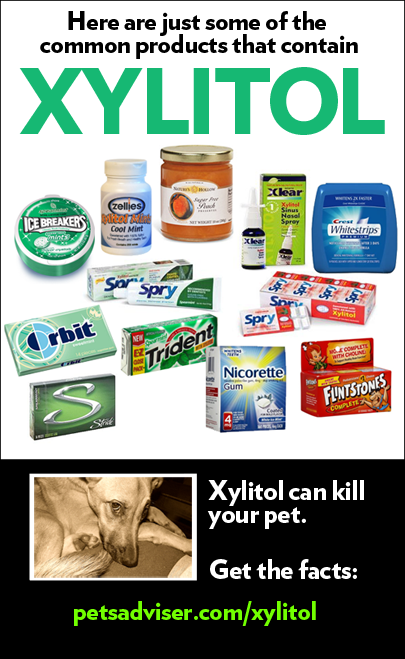 Until fairly recently, xylitol was found primarily in products not normally given to dogs. Poisonings were usually the result of dogs like Bruce sampling human foods, candy or gum on the sly. However, xylitol is now being found in certain peanut and nut butters. As most dog guardians know, our pets love these creamy butters. Many people use a dab of peanut or nut butter to hide pills or supplements they give to their dog, or they fill a Kong with the gooey stuff as a special treat. “First, dogs fed straight peanut butter as a treat or fed treats baked with xylitol-containing peanut butter may certainly be at risk for harm. You should be aware of any product in your home containing xylitol, and especially anything you might consider offering to your dog. That’s over a 200 percent increase in just 7 years, and includes only the cases called into the ASPCA-APCC. There are other animal poison control centers that receive calls, as well as unreported cases of xylitol-related illnesses and deaths. Although xylitol is safe for humans, the sweetener’s effect varies by species. In people, rhesus monkeys, rats and horses, xylitol causes little to no insulin release. However, it has the oppositeeffect on dogs, ferrets, rabbits, cows, goats and baboons. Its effect on cats is unknown. Humans absorb xylitol slowly, and the sweetener when ingested orally is absorbed at from 50 to 95 percent. However, in dogs, xylitol is rapidly and fully absorbed within about 30 minutes. Just a small amount of xylitol can cause a dangerous insulin surge and a rapid drop in blood sugar. The toxicity of xylitol in dogs is dose-dependent. The dose required to trigger hypoglycemia (low blood glucose) is approximately 0.1 grams/kg, while the amount needed to cause liver failure is about 0.5 grams/kg. Most gum and breath mints typically contain .22 to 1.0 gram of xylitol per piece of gum or mint. This means just a single piece of gum or one mint may cause hypoglycemia in a 10-pound dog. For more detailed information and graphics on how much xylitol is dangerous to different sized dogs, as well as a comparison of xylitol versus chocolate toxicity in dogs, take a look at this Preventive Vet page. Currently, product manufacturers aren’t required to list the quantity of xylitol on package labels, and while some companies will reveal the amount in their products, many are reluctant to do so. In some cases, you might be able to use the placement of xylitol on an ingredient list to estimate how much is in the product. In the U.S., ingredient lists for foods must be organized in descending order based on weight. The ingredient weighing the most is at the top of the list. In most chewing gum ingredient lists, xylitol appears in fourth or fifth place, making it clinically insignificant. But if it appears as one of the first three ingredients, extreme caution should be taken. In fact, I recommend dog guardians avoid or very carefully secure any product that contains any amount of xylitol, no matter how small. When it comes to medications and dietary supplements, U.S. regulations do not require manufacturers to list xylitol by name on package labels. This is because the sweetener is often categorized as an “inactive” or “other” ingredient, and such ingredients don’t have to be listed in order by the amount contained in the product. To confuse matters further, when xylitol is named in these products, it is often part of an alphabetized list, which could lead pet owners to assume — perhaps in error — that there is a very small amount in the product. That’s why it’s best, in my opinion, to either avoid or very carefully store any product that contains xylitol in any amount. Dr. Nicholas has compiled a fairly comprehensive list of products containing xylitol here. Symptoms of xylitol intoxication in dogs include vomiting, weakness, lethargy, loss of coordination, seizures and collapse. 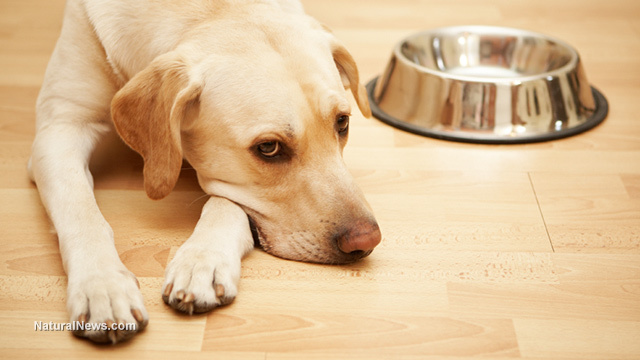 Hypoglycemia is usually evident within an hour or two after a dog ingests xylitol, but symptoms are occasionally delayed for several hours. Treatment depends on how quickly it is given. Vomiting is induced in cases where the xylitol has just been ingested. Once a dog develops hypoglycemia, IV dextrose must be administered until the animal can self-regulate his blood glucose concentrations, which typically takes from 12 to 48 hours. In dogs who ingest enough xylitol to cause liver toxicity, liver enzymes must be closely monitored, as evidence of hepatic necrosis can show up one to two days after ingestion. Should the liver begin to fail, the dog will require IV fluids, dextrose, hepatoprotectants (substances to help support and repair the liver), and regular monitoring of blood clotting activity. When xylitol exposure is caught early in a dog and treated effectively, the prognosis for a full recovery is excellent. The prognosis for dogs that develop hepatic failure is less optimistic.